1. Follow @BarrysTickets on Twitter. 2. 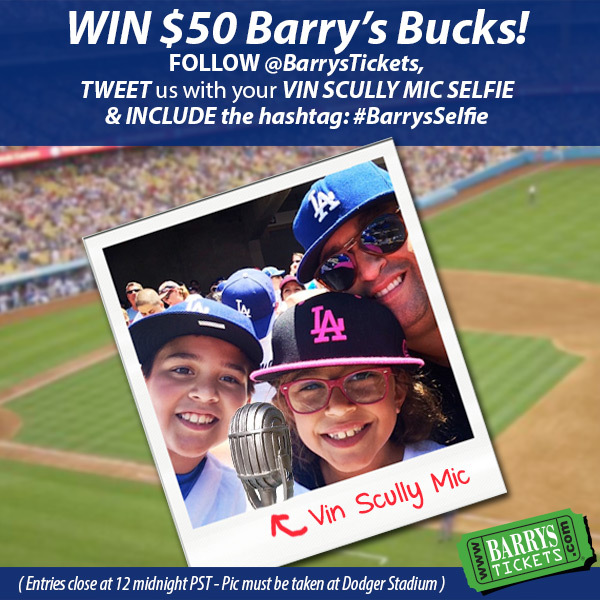 Take a selfie with you (or you and your friends/family) WITH the free Vin Scully mic at the Dodgers Game tonight (7/29/2014). You will then be entered for a chance to win $50 Barry’s Bucks! We will pick the winner by 5pm PST, 7/30/2014. Barry’s Tickets does not claim responsibility for any content submitted/uploaded in relation to this sweeptakes. Barry’s Tickets also reserves the right to reuse photos for marketing purposes. By submitting photos you are consenting to the rules of the contest. Winners will be chosen at random the following day after the game. By submitting a selfie to Barry’s Tickets, you grant Barry’s Tickets the permission to use your likeness in a photograph in any and all of its publications, including outside billboards and websites, without payment or any other consideration. You understand and agree that these materials and photographs are the property of Barry’s Tickets. You hereby irrevocably authorize Barry’s Tickets to edit, alter, copy, exhibit, publish or distribute these photographs for purposes of advertising, marketing, and publicizing Barry’s Tickets’s programs or for any other lawful purpose. In addition, you waive the right to inspect or approve the finished product, including written/physical or electronic copy, wherein my likeness appears. I also waive any right to royalties or other compensation or considerations arising or related to the use of these photographic materials. You hereby hold harmless and release / forever discharge Barry’s Tickets from all claims, demands, and causes of action which you, your heirs, representatives, executors, administrators, or any other person acting on my behalf of your estate have or may have in the future by reason of this authorization and release. Don’t miss any of the action! Dodgers Tickets including Dodgers Dugout Club Tickets for all games are guaranteed 100% authentic! Barry’s Tickets has been serving Los Angeles for over 30 years! For a complete list of Barry’s Tickets rules and regulations click here.